Scandinavian design, a coastal location and luxury furnishings - FitzRoy has the right ingredients for your memorable beside the sea holiday! 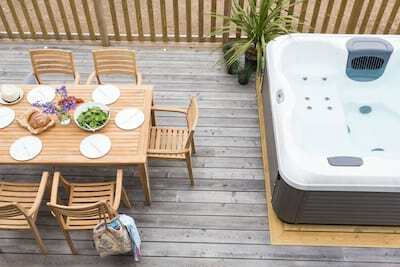 This smart wooden clad beach lodge is as perfect for couples, families or gaggle of friends looking to escape and unwind on the Cornish coast. Three bedrooms and three bathrooms complement the spacious living areas for the perfect holiday home footprint. Not a nautical stripe in sight, FitzRoy cleverly combines modern order with the more neutral tones of a coastal Scandi style. View the full gallery of luxury beach houses at Sandy Acres here. 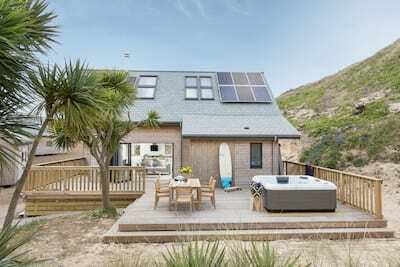 FitzRoy is a newly created wooden clad beach lodge within Sandy Acres, Hayle. A central hallway offers ample storage for your coats and wellingtons before leading into the hub of the open plan social spaces. A slick modern kitchen offers all you could need to fuel up your crew, with Cornwall firmly on the foodie map, get creative with the freshest of fare from nearby Trevaskis Farm shop and dine in style at the designer dining table. After a day of exploring, sink into comfy sofas, pop your feet up and relax. If a Winter break sounds heaven sent, light the fire and hunker down. The light and bright social space is adorned with thoughtful artwork and artefacts. Bedroom three is located on the ground floor with contemporary ensuite. A cloakroom completes the ground floor. A central staircase leads to the first floor and collection of two bedrooms and two bathrooms each with a bespoke colour palette that flows from the Scandinavian inspiration. Check in to FitzRoy and your holiday starts in style! Bi-fold doors slide back to the wooden veranda that hugs the entire front of the lodge, with the hot tub perfectly placed in the corner, days are spent dipping in and out of the bubbles. As the sun sets behind the dunes, gather as a group around the outside dining table. The master bedroom offers a private balcony for jackpot view of the sun, skies and sand dunes. The nearest beach is Sandy Acres at Hayle accessed along the bumpy beach track on foot in approx 5-10 minutes or pack up the car and drive a short distance to Gwithian or Godrevy Beaches, each offering a superb sand, surf and cafe culture. Cornwall offers a plethora of watersports so you are well placed to grab a board and hit the waves, kayak the coastline, learn to paddle board or perhaps a sail on the South coast? From walking the coast pathways to exploring the picture perfect villages throughout the county, set up your base at FitzRoy and check in for the ultimate staycation this year. Up to 2 well behaved dogs welcomed - dogs must be kept within the enclosed veranda and must be kept on a lead when walking around the Sandy Acres communal areas. There is a communal central outside shower within Sandy Acres, perfect for after the surf! There are 3 steps up to the veranda level. Level access from the inside onto the veranda. One internal flight of stairs. 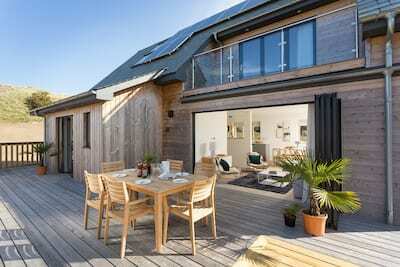 "Who wouldn't want to live in one of Cornish Gems' six new Sandy Acres beach houses. They come with the perfect surfers sandy-chic feel, but they're all geared up for families, too, with all the baby essentials." Fitzroy has a perfect location. A lovely comfortable house with plenty of space for family and pups, we all loved the walks on the beach and dunes. The house is very comfortable and had everything we could need. Thanks for an excellent stay! Property was excellent. Fabulous location, amazing beach nearby. House was perfectly set up, rooms were spacious and kitchen/lounge area was great for family. Hot tub was also great!